Struggling to sleep? Relax Sounds is the perfect white noise app that has over 20 free built-in white noise sounds to help you sleep peacefully! This includes relaxing sounds like: Ocean, Rain, Waterfall, Thunderstorm, Birds and many more, all fully mastered and produced to a high definition quality! Boost concentration by drowning out distracting thoughts with relaxing sounds! Stay calm & stress free! 22 free white noise sounds bringing you closer to nature! Create your own custom soundscapes with the mixes! Connect Airplay devices and listen with Apple TV. Background mode, listen to the relaxing sounds while you use other apps! High quality retina graphics and design. Favorite any sound for quick access in the favorites tab. 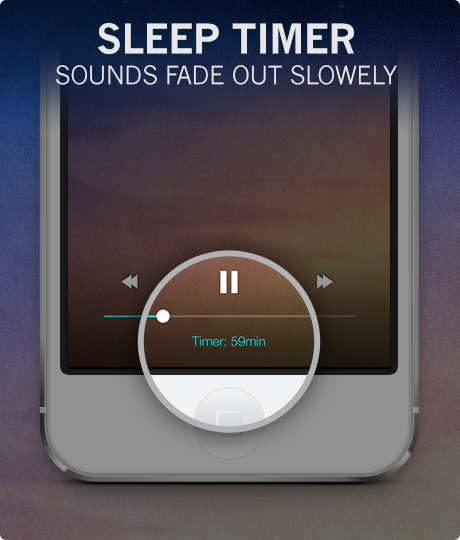 Set a timer for any sound to help you fall asleep, sounds fade out slowly so you won't wake up! Set multiple alarms, use your favorites to wake up. sounds fade in slowly so you wake up refreshed. Ambient sounds and White Noise work by reducing the difference between background sounds and a "peak" sound, like a door slamming, giving you a better chance to sleep through it undisturbed. If you have difficulty falling asleep or staying asleep, constant white noise and other sounds in Relax Sounds can help mask activity so you can rest!